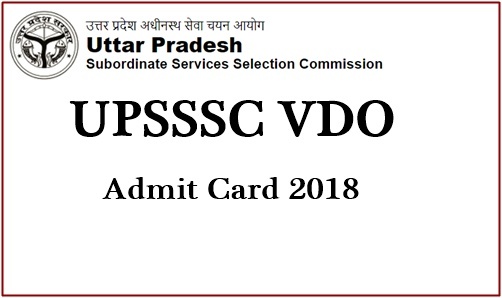 UP VDO Admit Card 2018 Download: Uttar Pradesh Subordinate Service Selection Commission (UPSSSC) is going to conduct the Gram Panchayat Adhikari / Village Development Officer (VDO) examination on 22nd & 23rd December 2018. Aspirants competing to get VDO posts will have to appear for the UP VDO written test to shortlist for the next rounds of selection process. As per the updates from the authority, thousands of aspirants are going to compete for the UPSSSC VDO examination this year. All the hopefuls must initially require to download UPSSSC Gram Panchayat Adhikari admit card to appear for the test. Candidates have to show the admit cards at the time of verification. The examination officers will not let the aspirants continue with the examination without showing the admit cards. Hence the hopefuls are instructed to download UPSSSC VDO Admit card/hall ticket from the official website upsssc.gov.in and keep it safe to carry to the examination. Uttar Pradesh Subordinate Service Selection Commission (UPSSSC) is the state level government organization that monitors the recruitment process of its affiliated organizations. Yearly, the UPSSSC announce various jobs for the aspirants. It releases many notifications to hire the suitable aspirants into various designations. This year the UPSSSC has invited applications for 1527 Panchayat Secretary posts. Many of the hopefuls desirous to get state government jobs in the state of Uttar Pradesh have applied in July /August months. The organization is going to shortlist the suitable aspirants through the written test and interview rounds. Applicants have to face the written test round soon in Oct/Nov months. To attend for this test candidates have to download UPSSSC Gram Panchayat Adhikari hall ticket beforehand. Check the details of the downloading process, hall ticket availability date and other guidelines from the following article. Applicants competing for the Village Development Officer Examination in the state of Uttar Pradesh can download the hall tickets from the official website, upsssc.gov.in. the hall ticket/admit card will be accessible to download before 10 days of the examination (approximately). Candidates can download UPSSSC VDO Hall ticket and check the details of examination venue, date and time from it. The UPSSSC will print the details of candidate’s name, DOB, hall ticket number and other details on it. Check all the details thoroughly after downloading the admit card. Carry the admit card along with any of the valid identity proof (Aadhar Card/PAN Card/Vote Card/Driving Licence etc) while going to the examination. Stay at the examination center before 30 minutes of the specified time to avoid the unnecessary tensions. Search the UPSSSC VDP Hall Ticket download link in organization website. Check the information in UPSSSC Gram Panchayat Adhikari Hall Ticket 2018.